Some days I think my students like me too much. When I was in college I had a professor that taught that and I quote, “It’s all about relationships.” I don’t know where in this wonderful world Paul Chaplin is, but he definitely taught me the most within my four years attending the University of South Carolina. I believe I gained the most from him because I cared about his feelings and I wanted to make him proud. I have a saying with my kids that some recite back to me at the end of the fourth grade. I tell them that I can be their friend the moment they walk out of my door the last day of school. Many of my girls giggle with excitement and some of the boys give an eye roll (I would have thought being my teacher’s friend was cool, but not all of my 4th graders think I am THAT cool). I am definitely not the scary, classroom management giant and sometimes that gets me into trouble. I had one mom tell me that her student said, “Mrs. Blalock is nice, but if you get out of line she will let you know it.” Last year I was grappling with the idea of becoming the fussy, toeing the line, and writing down every issue in my classroom kind of teacher (it was that kind of year). However, I found a better solution. The gifted and talented teacher in my school told me about class dojo. What? I don’t have time to teach karate too! No, class dojo is a classroom management app she informed me! That day I sat down and within one hour I had completely set up my classroom in the class dojo site and printed out parent communication slips for my students to take home! Class dojo is effective because it digitally records specific behaviors and gives feedback to parents. Parents can sign in online at any point of the day to see how their student is behaving and the program also sends out weekly updates. Within the app you give positive and negative points to individual students, and it keeps a running total with their gravatar. If you are a PBS school, you can simply give positive points. Positive Classroom Reinforcement: This is customizable! Another wonderful aspect about this tool is the fact that I can be in a reading group in the back of my classroom and see a student off task or on task somewhere within the classroom, and when I take or give points it automatically updates on my smart board for the students to see! 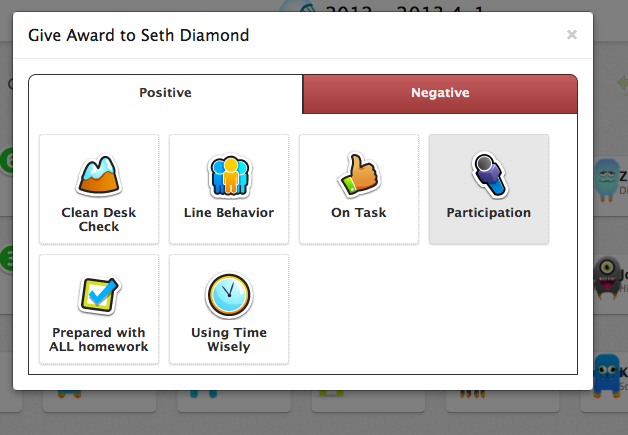 Class Dojo also has optional sounds that ring out with positive and negative points. I have had multiple parents write from home telling me how much they enjoy the daily and real time behavior feedback that they receive. Some even downloaded the app for their sons and daughters to earn points at home! Did I mention this app is free? Try out the app today and you’ll be prepared for your classroom in a few weeks! I found out about this app at the end of the year. I am setting it up right from the get go this year. I am going to track how many water and bathroom breaks kids take among other things. tracking bathroom and water breaks with this app is a great idea! It is a great tool! Let me know how it goes.